Pedestrians approaching the Bemis Center from the north have probably noticed a commanding new presence atop the building. Jason Manley’s 24-ft. installation Suspending Belief serves as a kind of beacon for Placemakers, our new exhibition that kicked off on January 13th with an electric opening. But Manley’s work is something more than a sign, it is a directive that informs the buoyant character of the show. Together nine national artists, each engaged in their own interventionist acts, have re-imagined the Bemis Center galleries, altering perception of the spaces inside. 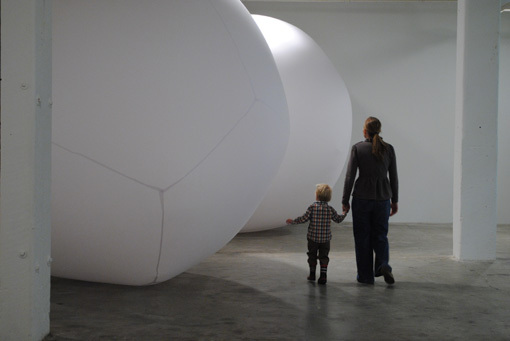 At the exhibition opening, kids laughed as they darted in and out of crevices between the giant white spheres of Quynh Vantu’s Squeeze. Shadows danced across the walls of Gallery 2 as people immersed themselves in Cybele Lyle’s video installation Untitled (Shifting Space). 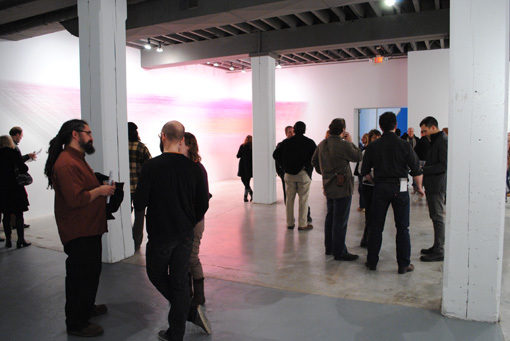 And conversations ceased as guests became lost in Anne Lindberg’s drawn pink, unsure of where the work stopped and the gallery space began. Downstairs in the bemisUNDERGROUND, guests experienced a wholly different type of show, one divorced from geography altogether. The work in TRANSCEIVER uses communication technologies to create a highly interactive experience. This includes a phone that receives periodic calls from the artist, a mysterious USB flash drive embedded in a wall, and an armband that monitors casualty reports, stabbing its wearer when a US soldier dies. In all, over 300 local art patrons crowded the halls of the Bemis Center for the exhibition openings. If you missed out, you still have time to experience these two shows. 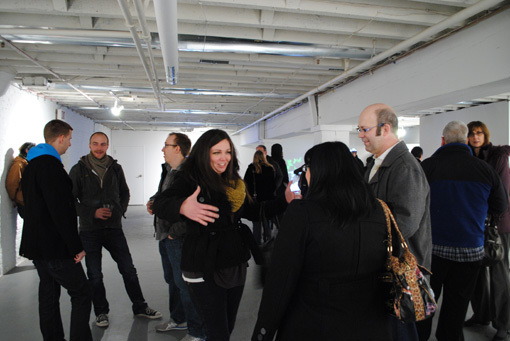 Placemakers closes on March 31, 2012 and TRANSCEIVER closes on February 11, 2012.